January Empties coming at you the old fashioned way. I currently have a cold and that does not make for fun YouTube videos. 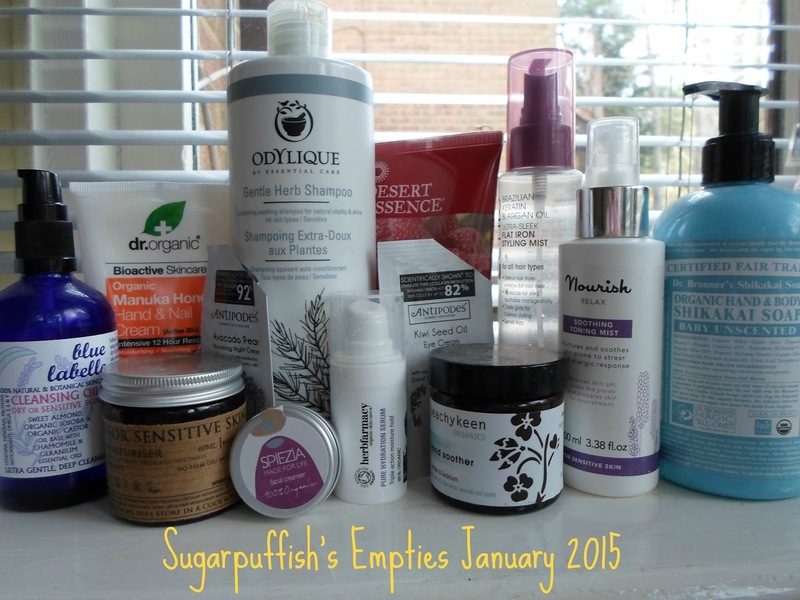 I have a nice collection of empties this month so I will talk you through them. Odylique Gentle Herb Shampoo - you all know this is the only shampoo I use, I love it. I now buy the 500ml bottle which saves a few pennies in the long term. Giovanni Flat Iron Styling Mist - another repeat purchase, can not be without this one, always have a back up. Desert Essence Red Raspberry Conditioner - love it, only conditioner I use, takes me several months to get through a bottle, works brilliantly for me and good value for money. Nourish Relax Soothing Toning Mist - I have been through a couple of bottles of this. It is a nice product with a good price point. Dr Bronner's Shikakai Soap Baby Unscented - I have mixed feelings about this product. I intended to use as body wash but I dislike how the colouration of the product tends to leave a "stain" on bath. This was better for me as a hand wash but I doubt I would repurchase. The original castille soaps remain a firm favourite with me. Dr Organic Manuka Honey Hand & Nail Cream - a product I have repeat purchased and one I find very effective on my dry hands. I am not going to replace this because I have decided I have a few "issues" with the brand and I am making more vegan choices with my skincare. Blue Labelle Cleansing Oil (Dry/Sensitive) - I have lost count of how many bottles I have gone through, a great product and brand ethos. I am sure I will repurchase at some stage but for the time being essential oils are taking a back seat in my routine due to recent skin problems. Gaia Creams Coconut Mousse (sensitive) - another brand with a great ingredient ethos. This is a lovely cleanser and I like the option of being able to customise to your skin type. I am unsure whether to repurchase simply because coconut has a habit of melting and when that happens having oil in a jar can get a little messy, I could refrigerate but then it gets lost behind the ketchup and forgotten about. Herbfarmacy Pure Hydration Serum - I was not too sure whether this serum was doing anything for my skin but once it ran out I certainly missed it. It does appear to boost my skin (when used under moisturiser) and I feel a reduction in dryness during colder weather. Peachykeen Hand Soother - this product has gone past its best before date so I'm binning it. A lovely balm which is rich and hydrating for extremely dry hands. It is best applied overnight and with cotton gloves. Spiezia Face Cleanser - a 15ml tester pot from a kit I received at Christmas. Lovely balm and I would consider buying the full size. Antipodes Avocado Pear Night Cream & Kiwi Seed Oil Eye cream (sachets) - a brand I love, Grace cleanser and Rejoice moisturiser are firm favourites so I was keen to sample these products. I did not like the smell of the night cream, for me ylang ylang is a dreadful scent. The Eye cream was a winner I was impressed despite not having much product to test. I understand now why every blogger raves about this one. If you have favourites or empties to share, tag a link in the comment section so we can go check out what you have been using up. I really must check out Speizia as they have had such a good rep the past few months.